We’d love your help. Let us know what’s wrong with this preview of Johnny Appleseed and the American Orchard by William Kerrigan. Johnny Appleseed and the American Orchard illuminates the meaning of Johnny "Appleseed" Chapman’s life and the environmental and cultural significance of the plant he propagated. Creating a startling new portrait of the eccentric apple tree planter, William Kerrigan carefully dissects the oral tradition of the Appleseed myth and draws upon material from archives and local Johnny Appleseed and the American Orchard illuminates the meaning of Johnny "Appleseed" Chapman’s life and the environmental and cultural significance of the plant he propagated. Creating a startling new portrait of the eccentric apple tree planter, William Kerrigan carefully dissects the oral tradition of the Appleseed myth and draws upon material from archives and local historical societies across New England and the Midwest. The character of Johnny Appleseed stands apart from other frontier heroes like Davy Crockett and Daniel Boone, who employed violence against Native Americans and nature to remake the West. His apple trees, nonetheless, were a central part of the agro-ecological revolution at the heart of that transformation. Yet men like Chapman, who planted trees from seed rather than grafting, ultimately came under assault from agricultural reformers who promoted commercial fruit stock and were determined to extend national markets into the West. Over the course of his life John Chapman was transformed from a colporteur of a new ecological world to a curious relic of a pre-market one. To ask other readers questions about Johnny Appleseed and the American Orchard, please sign up. Kerrigan's exploration of John Chapman's life and the mythology surrounding him is insightful. His defense of Chapman's choice for seeds over grafted trees makes good sense. Some more recent work on indigenous horticultural practices challenges his characterization, but Kerrigan also shares information on the more obvious European-model orchards adopted by some of the Iroquois relatively early in colonial history. Good conversations to be had from and around this book. A highly readable account of the life Johnny Appleseed. William Kerrigan explores the legand and the man as a nurseryman, pacifist, missionary, businessman, conservationalist, and minimalist. I recommend it with five stars! Before mass media and the Internet, there was folklore. (Whether folklore, in the sense of conveying a traditional cultural narrative, is facilitated, transformed, superseded or destroyed by the Internet is an argument for another day.) Stories about folkloric characters usually say more about the cultures that produce them than they do about the individuals themselves. That’s why the standard mythology about Johnny Appleseed is so unique. A pacifist, vegetarian, uneducated, impoverished, altrui Before mass media and the Internet, there was folklore. (Whether folklore, in the sense of conveying a traditional cultural narrative, is facilitated, transformed, superseded or destroyed by the Internet is an argument for another day.) Stories about folkloric characters usually say more about the cultures that produce them than they do about the individuals themselves. That’s why the standard mythology about Johnny Appleseed is so unique. A pacifist, vegetarian, uneducated, impoverished, altruistic Jesus-freak who opened up a vast frontier by promoting peace through fruit stands dramatically apart from the crude, violent, hell-raising folk heroes like Daniel Boone, Paul Bunyan, or Mike Fink. Appleseed was a lover, not a fighter. He may be the original counter-cultural hero. Of course, as Kerrigan’s history on the life and times of Johnny Appleseed demonstrates, the real man was not as pristine and benevolent as he was made out to be. Mostly, he was motivated by the desire to improve his own material condition, same as anybody else. Nor was he even necessarily all that eccentric, compared to the common rabble that one would find on the Ohio frontier in the early 1800s. What Kerrigan suggests, instead, is that the appeal of the Appleseed “brand” comes from how well he represented a traditional work ethic and a naturalistic form of American enterprise at a time when the frontiers were rapidly shrinking and technology was altering old world value systems. For example, as much as he railed against how it was unnatural to graft fruit trees, his arguments were unpersuasive to a generation of more well-off orchardists who could see clearly that grafting improved the quality of the yield. Johnny identified with older and he believed more virtuous ways of doing things – doomed though they were. Viewed that way, his famous eccentricity might be nothing more than righteous backwardness. To this day, there is plenty of popular sympathy for characters who refuse to change with the times. Kerrigan sees Johnny as a bit daft, but hardly insane, and outside of the mainstream, but not alone in his beliefs. I wonder how the man, John Chapman, would have regarded the mythology that developed around him. Personally, I don’t think that he’d have liked all of the attention, and the idea of a scholarly work based upon his life would probably make him deeply suspicious. He might call it unnatural. I was turned off, immediately, but the statement in the Preface that highlighted "domestication of a continent and North America". I am one of those who disagree with the notion of Manifest Destiny. You'd think I'd agree with the Johnny Appleseed notion on non-violence. I was raised in another country so Johnny Appleseed barely touched the map of my education. If they're throwing it down the children's throats, . . . well, I'm taking it at face value. I was disgusted with the academic flavor of t I was turned off, immediately, but the statement in the Preface that highlighted "domestication of a continent and North America". I am one of those who disagree with the notion of Manifest Destiny. You'd think I'd agree with the Johnny Appleseed notion on non-violence. I was raised in another country so Johnny Appleseed barely touched the map of my education. If they're throwing it down the children's throats, . . . well, I'm taking it at face value. A thoughtful and innovative reexamination of the life of John Chapman (aka Johnny Appleseed) and the later creation of the Johnny Appleseed myth. Kerrigan grounds his book in extensive and dogged research but also weaves a subtle and highly readable account of Chapman's story and the place of the American orchard and the Appleseed story in the saga of the taming and transformation of the American frontier. I'm not much of a history buff, but this was a decent read. It's more an early history of Ohio, combined with a biography of John (Johnny Appleseed) Chapman. Extensively researched. Very comprehensive. William Kerrigan spent his earliest years in the midwest, where he tasted bitter disappointment when he lost the role of "Johnny Appleseed" in the first grade pageant to a boy named Hal. After spending decades in the wilderness of the American West and South, he returned to Ohio to take a position as a professor of History at a small liberal arts college. That relocation renewed his interest in th William Kerrigan spent his earliest years in the midwest, where he tasted bitter disappointment when he lost the role of "Johnny Appleseed" in the first grade pageant to a boy named Hal. After spending decades in the wilderness of the American West and South, he returned to Ohio to take a position as a professor of History at a small liberal arts college. That relocation renewed his interest in the legendary apple tree planter, and his book, Johnny Appleseed and the American Orchard (Johns Hopkins University Press, 2012), is the culmination of fifteen years of research in libraries and local historical societies from Massachusetts to Indiana. At times he followed Chapman's path across the landscape by foot, bike, and kayak. 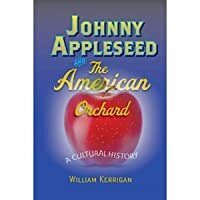 Johnny Appleseed and the American Orchard is more than a biography of John Chapman and the story of the Johnny Appleseed legend. It is also a history of the Old World apple in the New World, from the Puritans to the present. When he is not writing and thinking about apples, he teaches American History and directs his students in local history projects. The results of those efforts have included several museum quality exhibitions, an archive of oral histories, and three student-authored local pictorial histories.